Even if you are viscerally anti-choice, wanting to defund Planned Parenthood for performing abortions is like wanting to defund the entire military because of waterboarding. And it's ultimately, obviously self-defeating: if your goal is to reduce the number of abortions, then you want Planned Parenthood operational and fully-funded because, see, Planned Parenthood has prevented more abortions than every anti-choice group ever. But that hasn't stopped the yawping chimps of the right from doing a chest-thump of victory [e.g.] 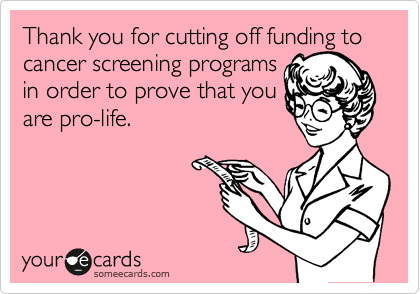 over the Susan G. Komen Foundation cutting off its funding for Planned Parenthood. It's not just that Planned Parenthood provides care for women seeking an abortion, the real reason they can't stand Planned Parenthood is the whole package: women's health and contraceptive services. They want female sexuality to be solely the male prerogative.